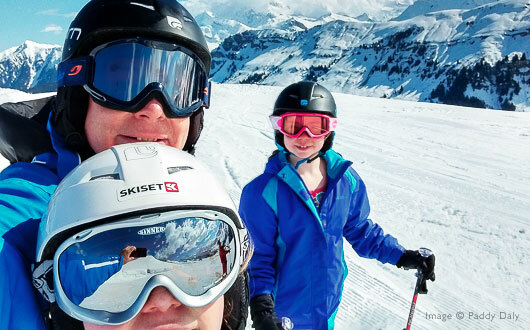 The ski resort of Les Menuires, which sits at a respectable 2000m in the very heart of France’s vast Three Valleys ski area, was voted Best Family Ski Resort at the prestigious 2015 World Snow Awards. We sent Paddy Daly and his young family to see what he thought of this acclaimed resort. Christmas is the ultimate family time and there is no doubting that having young children makes it even more enjoyable. With white Christmases a rarity in our part of the UK, the chance to spend the festive period in a family friendly ski resort was one not to be missed. It was our second such trip and the kids regarded the first as their best holiday ever. No pressure there then! As there had only been one major snowfall before our visit the surrounding countryside was quite green in places but the pisteurs (professionals who manage and groom the pistes each evening) worked their magic as we ate and slept each night, so there was plenty of good on piste ‘Corduroy’ skiing straight from the village. Skiing is obviously very weather-dependent so earlier in the season it’s advisable to go as high as you can. For this reason we had settled on a small satellite of Les Menuires, namely Reberty Village. It sits at 2,000 metres, a little higher than the 1850m main resort and is thankfully not known as a centre of boisterous après-ski. 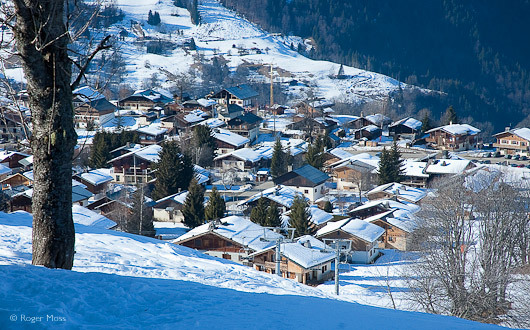 Possibly for the latter reason the village has chalets operated by two market-leading family skiing specialists (Family Ski Company and Ski Famille) as well a couple of mainstream operators, including Neilson. However, if you want to celebrate Christmas in style consider one of the three chalets from Powder N Shine. Chalets aside there are a couple of ski hire shops, a renowned restaurant (La Ferme de Reberty) and a popular Italian restaurant called Igloo. Both have piste-side terraces on which to enjoy your coffee/lunch. At my family’s fairly basic level of skiing, professional lessons are obviously really beneficial. Not only do you get an accomplished skier helping you improve your technique, you also get to see lots of the resort, safe in the knowledge that you won’t inadvertently end up on a run that is way beyond your ability. We also made sure we had helmets (compulsory for under 12s) and comprehensive insurance (see ‘Useful Info’ below). The slopes can get pretty busy at Christmas, and we all took a few tumbles. I was very glad of my helmet after a beginner collided with me and knocked me backwards onto hard snow. Thankfully, though, no harm was done. Ecole du Ski Francais (ESF) – the French national ski school – has a great set up in Reberty. 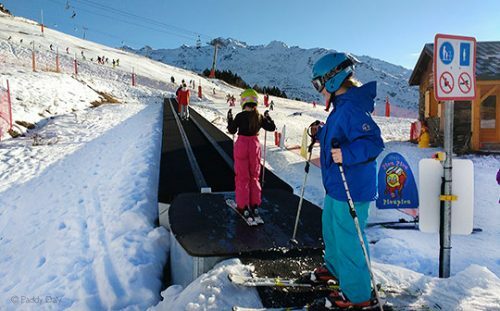 The centre is just across the piste from the village and features a gentle nursery slope with a ‘magic carpet’ lift back to the top, easy for even the smallest children. As I mentioned earlier, higher is usually better, and taking the fast cable cars/chairlifts lets you access even higher altitudes, with two lifts ending at over 2800 metres. Not only is the snow crisper, you also get some magnificent ‘Top of the World’ vistas which are wonderful on sunny days (of which we had several). If you are a good skier there are challenging Red and Black runs, but thankfully there are also some very pleasant Blue pistes, allowing you to explore all aspects of the resort, even at a fairly basic level of competency. On a practical note, unless you are an accomplished skier intent on exploring the full Three Valleys area, the more localised (and cheaper) St Martin-de-Belleville lift pass will be more than adequate. Les Menuires itself is more of a traditional resort, with bars, restaurants, fast food outlets, gift shops, a small supermarket, a weekly market and a smart new pool complex. It boasts a far longer magic carpet used for beginners and there’s also a bob sleigh themed roller coaster, where you control your own speed (quite daunting the first time you try it). Getting to Les Menuires from Reberty takes a few minutes on skis, but even on foot it’s relatively straightforward. The shuttle buses run regularly (there is a stop for Reberty, about two minutes’ walk from the chalet) and they are free to use. 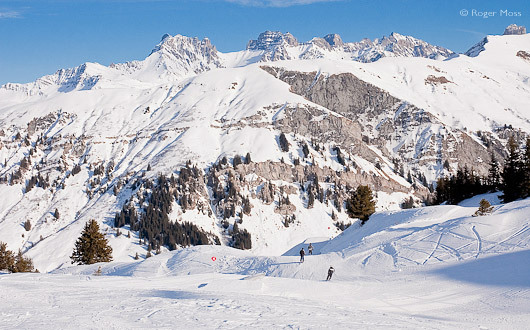 Les Menuires is an excellent base and well set up for family skiing, especially beginners and intermediates. 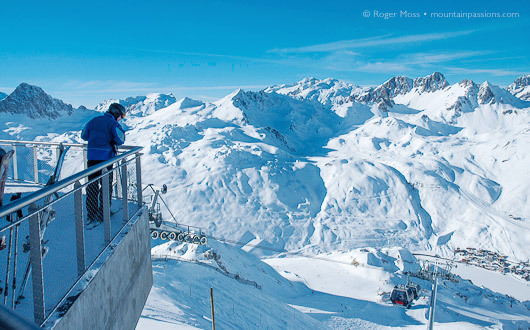 More advanced skiers have easy access to Val Thorens and the Three Valleys beyond, which is the largest ski domain in the world. Strenuous exercise and clean, crisp mountain air inevitably result in a massive appetite, and this leads nicely to our choice of accommodation. Chalet Flocon des Neiges, operated by UK tour operator Powder N Shine, is fully catered – in simple terms your breakfast, afternoon tea and evening meal are all prepared for you. This arrangement is quite common for ski holidays and makes the whole experience far more enjoyable. After a day of skiing I can’t imagine much worse than having to start preparing a meal for the family. The standard of catered chalets can vary wildly across the market. However, you generally get what you pay for, and Powder N Shine provides a very high standard of food and service. 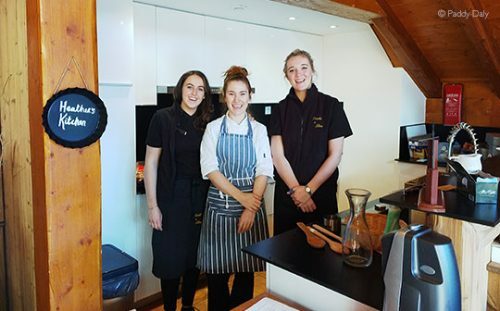 Whereas many operators rely on one, or possibly two, employees to cater a chalet, Powder N Shine have two full-time hosts and a professional chef for each. 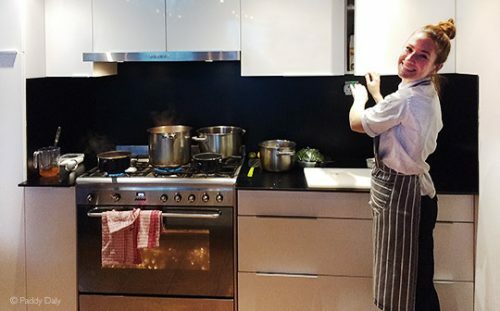 Not just any chef either – each has had recent experience working in kitchens of Michelin-starred restaurants. Our chef Heather Frew had previously worked at restaurant 21212 in Edinburgh and had also been a private chef for a renowned wine-producing family in Bordeaux. The menus were her own creations, as the company simply believes in its chefs and lets them get on with it. As a committed foodie, I loved this. Imagine having a high-calibre private chef prepare your meals every night. It was heaven. If you want to do something different for your family Christmas next year, give Les Menuires a try. Skiing is healthy, active and invigorating – and a lot more fun than slumping on a sofa watching TV repeats. It’s also a million miles away from the crass consumerism of Christmas in the UK. A catered chalet gives you the ultimate in relaxation at an often stressful time of year, and if you want the best look no further than Powder N Shine in Reberty Village. At 2,000 metres you are well placed for good snow coverage and you have access to the piste and ski school right outside your door. Enjoy your mornings improving your ski skills in the crisp mountain air, and after that there’s afternoon tea and cakes (all freshly made, of course) and then more skiing. Alternatively soak away the aches in one of the hot tubs (one inside next to the sauna, or try the one on the balcony looking out over the valley) before the canapes and aperitif arrive. It’s a blissful way to spend Christmas week. 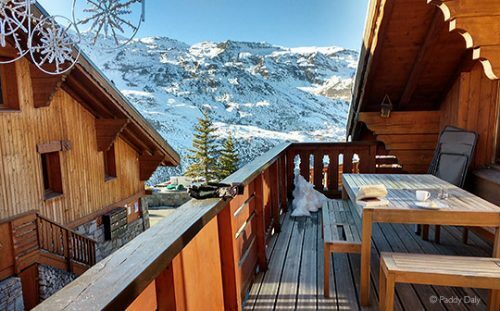 Our feature author Paddy and his family stayed at the Chalet Sapin de Reberty, one of five Powder N Shine chalets in Les Menuires. All are ski-in, ski-out and situated piste-side giving quick access to Les Menuires and the Three Valleys. If you fancy a break from the usual over-indulgent Christmas this year, the Powder N Shine (www.powdernshine.com ) chalet Sapin de Reberty in Reberty Village is getting a makeover this summer, ready for the 2016/17 winter season. It sleeps 15+ and prices include accommodation and all meals, except for one evening when the staff have a well-deserved night off. Follow the A430 to Albertville, then Moûtiers. Take the D117 for 27km to Les Menuires. The nearest airport is Chambery (100km).Jet2.comoffers low cost flights to the French Alps from 7 UK airports. For bus connections see www.mobisavoie.fr (in English) to book your journey in advance. An adult return from Chambery airport costs €50. This couldn't be easier - there are trains travelling from London to Moûtiers every Saturday. High-speed TGV services run daily from Paris. Late arrivals on Saturday nights can visit the Information chalet at the entrance to the village where help will be at hand to guide you to your accommodation. Tel: +33 (0)4 79 00 69 04. Lift passes, equipment hire and lessons can all be arranged through chalet provider Powder N Shine and the lift passes will be waiting for you as you arrive. Similar arrangements are normal for other tour operators. Les Menuires official website is a great source of information and lift passes. There’s a useful smart phone app too. Les Trois Vallées (The Three Valleys) is the official website of the Three Valleys and shows the extent of this impressive ski area. 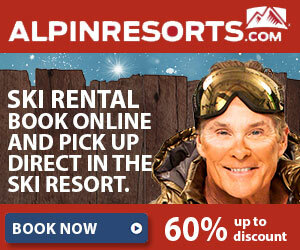 Save precious skiing time when you book your ski equipment online with ALPINRESORTS.com After a quick and easy reservation everything will be waiting for you when you get to the resort. You get to choose the shop and there's a BEST-PRICE GUARANTEE. Whatever accommodation you're looking for, search Booking.com for the best deals. 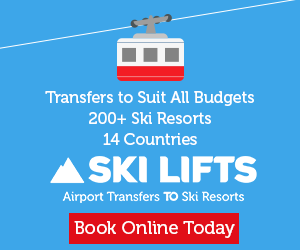 Ski-Lifts offer the widest range of airport transfers to ski resorts in France, from economy shared transfers for budget-conscious travellers, right through to luxury limousines. They also offer coach transfers for larger groups.